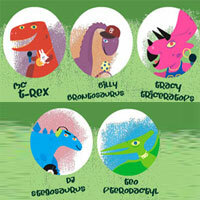 About The Artist: Hall of Fame hip-hop producer Prince Paul teams up with some of rap music’s most-celebrated MCs to create a prehistoric, preschool musical masterpiece. Part book-on-tape (narrated by Grammy-winning poet Ursula Rucker), part Broadway show (the story was recently opted for a cartoon series! )…the CD takes kids (and parents) on a musical journey that tells the story of 5 best Dino friends who come together to teach key life lessons and have fun. It’s Three Feet High and Rising for the next generation.